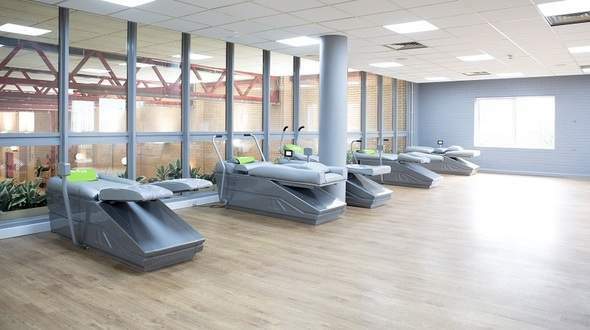 Our spacious health and fitness suite has an extensive range of all new Technogym equipment including cardio vascular and resistance machines. There’s also a dedicated free weights section and a large warm up area which is perfect for extra training. We're equipped with 12 Shapemaster Toning Tables. Unlike conventional exercise equipment, Shapemaster’s range of exercise equipment does not rely exclusively on muscle power but by an electronic power system enabling you to work passively or actively, depending on their ability. As you do not have to provide the motion force, you do not have to overcome inertia in order to use the equipment, so it is a perfect choice for anyone coming back to exercise after periods of rest or inactivity, including the elderly or those with mobility issues. If you feel intimidated or uncomfortable in a traditional gym environment, the 12 pieces of toning equipment are located away from the main gym so perfect for you to relax and go at your own pace. The equipment can also be used to manage and rehabilitate those living with conditions such as MS, Fibromyalgia and Post-Stroke. Pedal your way fit in our air conditioned group cycling studio. The centre features 24 brand new Technogym bikes. Our superb beach style leisure pool provides hours of entertainment! With water features to keep the kids entertained and a wave machine operating during peak periods and at weekends it makes the perfect venue for a family day out. Lane swimming is available for those looking for a more energetic workout. Find the perfect way to keep active in our group fitness classes such as Group Power, Circuits, Aerobics, Yoga, Pilates, Group Fight and Buggy-a-cise. We have one large and bright group fitness space and one smaller studio. Stay fit with racquet sports; it’s a great way to improve your reflexes, hand to eye coordination and overall fitness levels. This centre has three popular squash courts which are available to use as a member or pay as you go. We offer a vast range of activities within our 6 court sports hall. And many more sports available for casual or block bookings. Children under five can be booked into our crèche for up to two hours while you workout in the gym, take part in a fitness class, or other activity at the centre. Your little ones will be having fun and making new friends whilst being cared for by our fully qualified staff. Please pop in for more information and a registration form. Our crèche runs on Tuesdays, Wednesdays and Thursdays 9.30am-11.30am.